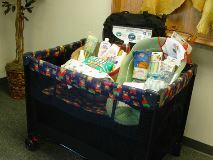 NPRA provides a basket of baby-care essentials for every new mom at the Pine Ridge Hospital. Almost every day, a baby is born into the Oglala Sioux Tribe of South Dakota. Like babies everywhere, they are welcomed with joy and hope for the future. "It is strictly believed and understood by the Sioux that a child is the greatest gift from Wakan Tanka [the Creator]," says R. High Eagle. Yet on the Pine Ridge Reservation, one of the poorest communities in America, these little ones may already be off to a difficult start in life. Many mothers-to-be here face high-risk pregnancies, due to poor diets and impoverished living conditions on the reservation. Sadly, these young women who are most in need of pre-natal care may also face great obstacles to visiting a doctor. Lack of basic transportation and distance make it extremely difficult to travel to a health clinic. Once there, patients may wait hours for an appointment. After the baby arrives, many parents can hardly afford the most basic infant-care items. 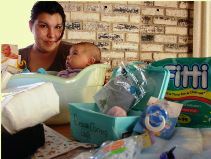 Adrianna put the NPRA baby basket to use for her daughter Desirae. To help these struggling young families, the Northern Plains Reservation Aid™ (NPRA) program provides a basket of essential supplies for every new mom as she leaves Pine Ridge Hospital. 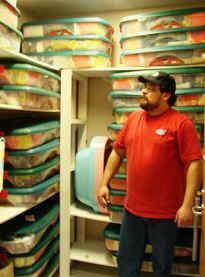 The baskets include necessities such as clothing, blankets, bottles, diapers, bath supplies, and skin ointments. Many of these items are expensive or difficult to find on Pine Ridge, where most shopping is limited to the local convenience store or gas station. Mothers, who typically devote all their meager resources to their children, also receive a few gifts for themselves such as soap, shampoo, toothpaste, and lotion. New parents can earn additional gifts for their babies by participating in pre-natal care and parenting classes. Through the baby baskets and incentives, NPRA is helping the Oglala Sioux bring healthier babies and happier families into the world.